Product #20705 | SKU VT-3000 | 0.0 (no ratings yet) Thanks for your rating! The Magnus VT-3000 Tripod System with Fluid Head is a stable, sturdy video tripod made from anodized aluminum that can support loads up to 3 kg. It provides many features commonly found on more expensive models. The two-way fluid head provides smooth operation, and features a half-ball mount with a diameter of 65 mm, with left and right pan bar mounts. One pan bar comes included. The VT-3000 tripod system weighs 3.5 kg. 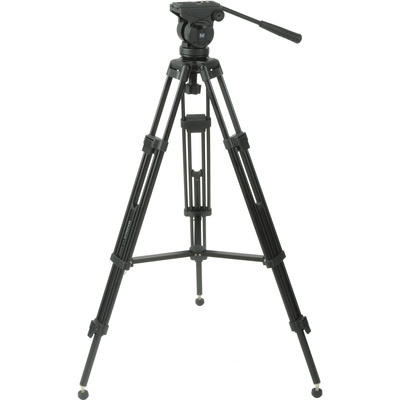 The 3-section leg design allows you to adjust the height of the tripod from 72.6 cm to 155 cm. A mid-level spreader and passive counterbalance provide improved stability. The VT-3000 has separate pan and tilt locks and a bubble level for precision leveling, and offers a full 360° pan range. The fixed counterbalance spring incorporated in the head provides smoother tilt movements.